This post is a little out of sync, but then hasn't everything been lately!! Extreme cold must dull the brain. The temperature has been plunging regularly to the -20s ºC from the mid - 10s ºC this February, making it the coldest February on record. Hence, I have had "brain-freeze." Things need to lighten up before I can see the levity in any situation. It did warm up to snow yesterday, so we got another dollop of frozen white stuff. It makes for pretty pictures, but not for easy travelling, either by car or on foot. In the category of "those who struggle shall be rewarded, eventually," I did manage a walk the other day and I was indeed rewarded!! 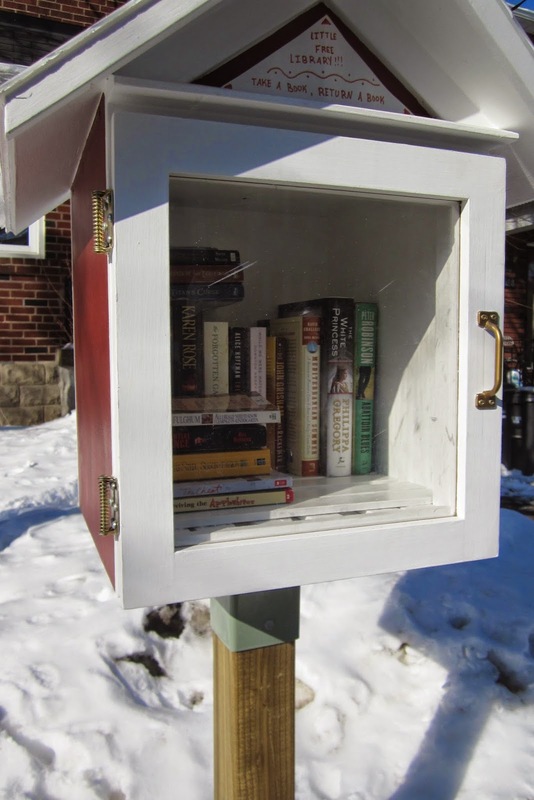 I came across this mini library on some Good Samaritan's front lawn!! I have seen them on-line, but like so much of what one sees in the media, it's always somewhere else, never here!! Well, here it is. For those in the neighbourhood, its on the north side of Soudan, a house or two east of Cleveland. The books were typical winter fare - a Danielle Steel or two, a Robert Ludlum, a John Le Carre´ and a book entitled "While We Were Watching Downton Abby." I was tempted by the last one. As one of the few people in the world who has never watched a soap opera, I wondered whether the book was the distillation of my philosophy of life, or at least the TV watching side of life. Struggle on, read on, write on....oh yes, right on! !